Fortis Group, a Manchester based property developer, has announced that it is on target to deliver a pipeline of more than 1,900 new homes in Salford by 2020. Spanning five developments in the area, Fortis Group’s investment in the area is set to top £340 million, creating a total of 1.8 million sq. ft. of high quality, residential living space. The company launched its latest development in the area earlier this year – the £72 million, 376-home Bridgewater Wharf on Ordsall Lane. The scheme is located close to both Salford and Manchester city centre, and is a short walk from Cornbrook Metrolink, with tram connectivity to Salford Quays. Bridgewater Point is also located on Ordsall Lane and will bring a further 220 apartments to the area. The £33 million development spans 222,000 sq. ft. and will include an on-site gym and landscaped gardens for residents when finalised. Construction is due to start on Bridgewater Wharf in Q3 2018, with Bridgewater Point setto reach completion in Q3 2018. Once completed, the £150 million scheme will contain circa 700 units across four sites. Three phases are currently under construction, with the final due to commence in 2018. 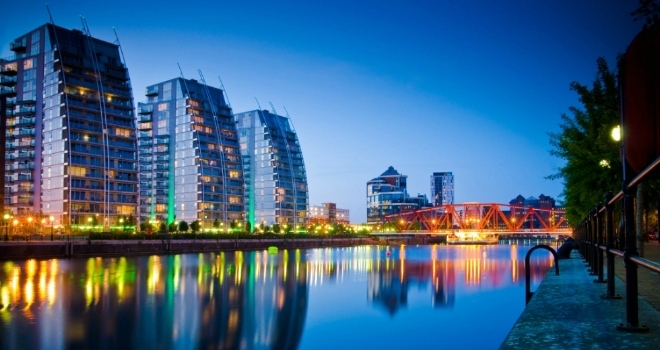 Kieran Moore, director at Fortis Group, said: “Salford is a highly sought-after area for young professionals looking to live in close proximity to some of the region’s most dynamic employers in nearby MediaCity and Manchester city centre.